If you’re experienced in the real estate trade, you’ve probably heard the occasional reference to Tax Lien and Tax Deed Investing. It’s a niche that has the potential to be insanely profitable and it has provided a lot of big breaks for investors around the country. It’s a solid, time-tested approach that has made a lot of money for a lot of people, but I still have my issues with it (and we’ll get to that in just a minute :). I’ve found that most investors don’t have a very thorough understanding of how this investing strategy works (it even took me a few years to figure it out), so I wanted to give you a basic overview of what’s going on in this realm, how the mechanics work, and most importantly – I want you to see the merits behind this approach and why it’s a major opportunity to cash in on a TON of free real estate equity. With any luck, I think you’ll start to see what all the excitement is about. As any property owner can tell you – every piece of real estate in the United States is subject to property taxes. If you own real estate, you’ll be expected to pay these property taxes each year. If you fail to pay these taxes, your property will become “tax delinquent”, which means it has started down a path that will eventually lead to tax foreclosure (i.e. – your property will be seized and repossessed by the county or municipality) IF you fail to pay these taxes current within the required time frame. How long can a property can go “tax delinquent” before it is seized by the county? It all depends on the state. In every state in the U.S. – there is a set date during the year when, if the taxes have been delinquent for a set period of time, they will be seized by the county. In some states, the county will wait for 2 years, others will wait for 5 years, but none of them will wait forever. Regardless of whether a property is owned “free and clear” of any mortgages…; if a property owner decides to quit paying their property taxes, they will inevitably plan to lose their property to tax foreclosure. Every state has a unique set of rules and regulations when it comes to the time frame required to pay taxes current, how the foreclosure process is handled and how each county will try to re-gain its lost tax revenue. Depending on which state you’re working in, there are some basic rules you need to understand about how the process works. Almost every state has SOME kind of variation in how they handle the various aspects of their process. No two states are exactly the same in all respects, regardless of which kind of tax sales they have – so whichever state you decide to work in, be sure to take your time and do your homework. Generally speaking, a county’s primary concern is to generate enough revenue from each property to make up for their lost tax revenue (whatever that number happens to be). Surprisingly, the actual “market value” of each property is mostly irrelevant. Even if a property could feasibly sell for $500,000 – the county’s intent is to generate enough funds to restore the amount of unpaid taxes they were owed from the delinquent property owner – so for example, if a property worth $500,000 only had $10,000 of delinquent taxes at the time of foreclosure, this $10,000 number is usually the county’s only real concern (and sometimes they will even start the opening bid amount at this price). The supposed $500,000 “market value” holds little relevance to the county – and this is where the real opportunity comes from at a tax sale. A lot of properties can be bought for ridiculously low prices at a tax sale. Why? Because you’re not dealing with a normal property owner who cares about getting full market value, you’re dealing with the local government. Contrary to popular belief, it’s not the government’s goal to get rich off every property they sell. They just want to get these properties off their books and in return, they want the money they were owed in the first place (with the hope that these properties will end up in the hands of someone who will keep the property taxes paid current). In Tax Lien States, when a property becomes delinquent for non-payment of property taxes, the county will sell a “tax lien certificate” to an investor as a way of recouping these unpaid property taxes. When someone purchases one of these tax lien certificates, they are not buying an ownership interest the property. Instead, they are buying a lien on the property. As the owner of a tax lien certificate (aka – tax lien), the delinquent property owner still owns the property. However, the lien holder is entitled to repayment for the amount of the tax lien certificate plus interest. If the property owner fails to pay off this lien within the “redemption period” specified by their state, the lien holder has the right (but not the obligation) to foreclose on the property and take ownership. In most cases, if the lien holder does not move forward with foreclosure within the period of time specified by their state, the lien will be forfeited and the lien holder will lose their investment. Every state has a different set of rules regarding the redemption period, the amount of interest that can be charged, the foreclosure proceedings, and several other aspects of the process. Generally speaking, once you understand how it works in one state, you’ll be able to learn how other states work relatively quickly (because there are simple variations to the same basic process). In Tax Deed States, the process is quite a bit simpler than that of tax liens because when you buy a tax deed, you are buying the actual property. The process is simpler because in most Tax Deed States, there is no redemption period. Similar to tax liens, the county’s primary interest is to recoup the unpaid property taxes on each property. Once a tax deed has been sold to an investor, the prior owner cannot come back and reclaim their property. When you purchase a tax deed – you own the property free and clear. Similar to tax lien states, every tax deed state has a different set of rules about how long a property must be delinquent before foreclosure occurs, but given that there is no redemption period, most of the complexities are eliminated, which makes it a much simpler system for investors to work with. If you can envision Tax Liens on one end of the spectrum and Tax Deeds on the other, Redeemable Deeds live somewhere between the two because they share some similarities with both sets of rules (and many of these similarities depend on which state they are being sold in). When you purchase a redeemable deed, you are literally purchasing a deed to the property (just like a Tax Deed). However, a redeemable deed is also subject to a redemption period (just like a Tax Lien), which adds a bit of complexity to the process. For a set period of time after a redeemable deed is sold, the prior owner has the right to “redeem the deed” and purchase the property back from the investor. In order to purchase the property back, the prior owner has to pay the full amount that was paid for the property at the tax sale along with some costly fees and penalties (regardless of how much time has accrued during the redemption period). If the prior owner does not redeem their deed within the specified redemption period, they will lose all their redemption rights and the investor can rest easy knowing that they are the official owner of record. There are a few states with some counties that sell Tax Liens and others that sell Tax Deeds. There are various reasons for this kind of set up (which I won’t get into here) – but the key is to simply do your homework when you’re working in these states (detailed above) and make sure you understand what you’re dealing with at each tax sale, so you can avoid any confusion about what you’re bidding on at an auction. If you’re trying to decide whether to invest in tax liens or tax deeds – I think it really comes down to what your goals are as an investor. If you’re looking for an investment with a very strong return (far higher than anything you’d ever get from a conventional investment), tax liens are a great way to do it. For example, New Jersey offers a maximum rate of 18%, Arizona offers a maximum rate of 16% and Iowa offers a guaranteed 2% per month (i.e. – 24% return annually). Not to shabby…; assuming the property owner actually decides to pay you off before you become the owner of the property. If you want to eliminate any ambiguity about whether or not you’re going to own a property (i.e. – if you actually want to own the property and/or flip it for a profit), tax deeds can be a great way to do this. Personally – my goal is to buy and sell real estate (rather than simply earning a return on the money I’ve invested, with no certainty about what will happen in the end). Given this, you won’t find me purchasing tax liens anytime soon…; but again, that’s just me. Not everyone have the same objective that I do. Now that I’ve given you (hopefully) a clear, unbiased explanation on how tax liens and tax deeds work – along with some legitimate reasons why you might want to consider investing in them yourself…; I’d also like to explain why personally, my history with them hasn’t been so great. Also keep in mind, I don’t consider myself to be an expert on tax sales, so take these next few paragraphs with a grain or two of salt. I’ve been to a few auctions in my time and I’ve taken the time to learn how this whole process works, but it’s not because I like to buy tax liens and tax deeds myself. I find it relevant only because the process of tax foreclosure works hand-in-hand with my primary investing strategy. My goal is to buy tax delinquent properties BEFORE they are seized by the county (i.e. – before I’m one of a hundred other competing bidders, struggling to find a worthwhile deal at an auction). When a property is foreclosed due to delinquent taxes – it creates a significant blemish on the property’s title – one that most title insurance companies will never insure over. As a result, it can be extremely difficult to sell a property that you purchased out of tax foreclosure, because if your buyer can’t get title insurance, they can’t get a mortgage, which means they can’t buy your property! 1. You can pursue a quiet title action, which is a 3 – 9 month legal lawsuit which can clear this title issue through the courts. Typically the cost will be about $2,500+ (all in). 2. You can use a tax deed title clearing service. Assuming the county followed the correct procedures (and the vast majority of them do), this option typically takes less than two months to complete and will cost somewhere in the range of $1,950 – $2,150. Keep in mind that with either of these solutions, you won’t be able to administrate the “fix” until AFTER you’ve purchased the property (which requires a leap of faith), and you’ll still have to deal with any government liens on your own – grass mowing fees, demolition judgments or EPA environmental liens (just to name a few). Regardless of which option your pursue, it’s a good idea to get a title report on your property to see the full picture of what’s going on. …;and if you fail to pay the full amount at the time of purchase, your purchase will be cancelled (and it may result in you losing your deposit and/or being disqualified from future sales). I understand why a county requires all cash upfront – I really do…; but when I was getting started, I didn’t have a giant pile of cash to start with. If you’re gunning for a property that gets bid above the price you’re able to pay (which in my case, was always a REALLY low price), you’re out of luck. Given that auctions have a way of sending property prices WAY out of “good deal” range, the few times I’ve attempted this method have proven futile for me. For the same reason I’ve always had trouble finding great deals on the MLS, I’ve always had trouble finding great deals on properties at an auction too. When you think about it – the whole premise of an auction is to create an environment in which bidders have to compete with each other to buy things. 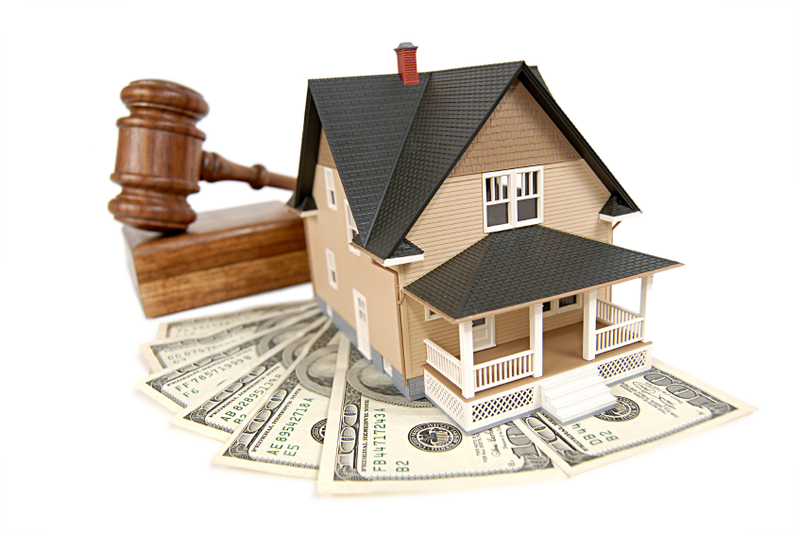 Auctions are designed to work toward the benefit of the seller (i.e. – the county) and in most cases, it does. Don’t get me wrong – this doesn’t necessarily mean that deals can’t be found at a tax sale (because I know of several investors who find them routinely), but the fact is – an investor’s ability to succeed in this kind of buying environment is highly contingent on who else is in the room and what they’re willing to pay for the same properties. In the auctions I’ve attended (and I’ve only been to a few, by the way), I found the process to be rather annoying and even a bit disappointing. The properties I had my eye on, also had another 100+ other contenders who were more than happy to bid the price FAR above the point that it would have been a profitable investment for me (or anyone else, for that matter). I don’t deal well with this kind of competition (and I’m not sure how anyone else could either), especially when I know there are other ways to find deals. For these reasons, I can’t say that tax liens and tax deeds are my preferred method of buying real estate. HOWEVER, I do know of several other investors who pursue this strategy and they find great deals on a regular basis. Every investor has to choose which strategies they’re going to pursue and which strategies they’re going to ignore, and this is one I’ve chosen to ignore (for the most part). Keep in mind, this doesn’t mean that YOU can’t find great success here. I’m certainly not the greatest investor alive – and I honestly don’t want to discourage you from pursuing this strategy if you think it’s worth exploring (believe me – I had plenty of people tell me that land investing was a waste of time and they ALL turned out to be wrong). Joanne Musa (aka – the Tax Lien Lady) has an incredibly helpful and detailed course that goes into great detail on this subject. There were several states that had very limited information on how their processes are handled and her information was a MAJOR help as I was trying to put the pieces together and show a comprehensive layout of the entire United States in one easy-to-find place. If you need more information on the subject, her material is definitely worth checking out. Disclaimer: The map shown above is a representation of the information I was able to find and interpret through many hours of research. While I believe the information is pretty reliable (I did include links within each state, so you can see my sources), I cannot guarantee its complete accuracy. Many states change their laws and statutes from year to year, so before you dive into the pursuit of tax deeds or tax liens in any particular state, be sure to verify the information above before you get too far long (depending on when you’re reading this, things may have changed in your state since this map was created). Become an REtipster Email Subscriber! 100% Privacy. No Spam, Ever.